Mealy has provided comprehensive advice on domestic and offshore financing matters, structuring for bank capital requirements and asset financing. Her vast experience covers a wide spectrum of industry sectors, coupled with her familiarity with the procedures, and legal and regulatory requirements of the securities exchange and the central bank. She sits as panel lawyer for some 7 banks. She has experienced in providing practical legal solutions for clients in response to their business and investment strategic needs, from establishing and organising businesses to supporting administrative and corporate functions. In terms of commercial and business contracts, Mealy has advised on every aspect of business, from the day-to-day operations to commercial transactions. She has drafted contracts for a wide spectrum of businesses. 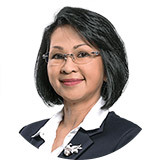 She also has represented domestic and international investors, public listed real estate companies, commercial banks in a full range of real estate and real estate related transactions from initial acquisition and through to the final divestment. From investments and divestments, leasing and tenancies, to joint ventures and project management, she has the requisite knowledge and experience to help and represent, whether a buyer or seller, landlord or tenant, or a property developer. Regarding the litigation and alternative dispute resolution, Mealy has wide-reaching litigation experiences, ranging from personal rights to commercial disputes and corporate concerns. Where the preferred route is a non-court forum, she can also assist in the fields of arbitration. Apart from the private matters, Mealy has been involved in law reform and acts as an advisor to the Royal Government of Cambodia on wide variety of land and agricultural matters, particularly the Land Law Implementation Project and the Agriculture Sector Development Project with the Asian Development Bank. Her experience in trade law saw her involvement as the Chief Editor/Translator of WTO Trade Negotiations Materials for the Ministry of Commerce, in charge of various prominent references and handbooks on business, trade negotiations and other related literature. Mealy is well versed in her own local Khmer language, which is a strong asset in a country where the official language and official documentation are in Khmer. In the past, she was responsible for the collection and translation of numerous publications into English and Khmer, the most important of which is the Compendium of Cambodian Laws published by UNDP and the Cambodian Legal Resources Development Centre, under a funding from the Canadian International Development Agency (CIDA). She has co-edited with Dr. Sok Siphana the Khmer Edition of ‘The Legal System of Cambodia’ (1998), ‘Legal Aspects of Doing Business in Cambodia’ (1998) and ‘Formulation of the Legal and Judicial Reform Strategy’ (2003). Her latest publication with Dr. Sok Siphana is ‘Cambodia Trademark Law and Practices”. Mealy started her legal career working as a Paralegal and Office Manager for the law firm of Sarin & Associates in 1996. She commenced her own legal practice in 2001 upon obtaining her law degree. She became a partner of SokSiphana&associates when the firm joined the ZICO Law network. Executive Board Member of the National Commercial Arbitration Center. Chairman of a Non Profit Organization, Song Saa Foundation. Independent director of Aeon Microfinance.